First Berkshire Fleet List: FastTrack 65626, 65628 and 65631 were withdrawn on 20th June in addition to 65627. Bluebird 61135 entered service at Bracknell on 20th June. Thanks to Mat Wooll for this. Stagecoach in Oxfordshire and Warwickshire Fleet List: 20542 has transferred from Oxford to Witney. Nuneaton 13625 has transferred to Leamington. Withdrawn Leamington 20401 has been converted into a training bus, whilst withdrawn Rugby 40150 has moved to storage at Nuneaton. Leamington 20704, and Rugby 40158 and 40159 have transferred to Aberdeen. Withdrawn Leamington 40142, Nuneaton 40146 and Rugby 41506 have also departed at some point. Leamington 47003 has been put in reserve with accident damage, and Rugby 14932 is also in reserve. Following the change in Managing Director at Warwickshire from 1st June, 92001 has transferred to Northampton whilst the new MD has Audi A4 90018. Vauxhall Vectra 91719 has arrived at Nuneaton recently as a Megabus crew vehicle. Stagecoach in Oxfordshire and Warwickshire Fleet List: 50040 has finally returned from repairs at Plaxton after catching fire in July 2004. It is painted plain red with a white rear bumper, and is to return to service with the Oxford Tube shortly as additional cover whilst the Neoplans are away for warranty work. It's future beyond this is unknown. First Berkshire Fleet List: FastTrack 65627 transferred to First Essex on 21st. Thanks to Mat Wooll for this. Weavaway Travel Fleet List: SN05 FNW is actually SF05 FNW. Thanks to Derek Bradfield for this. Reading Transport Former Vehicle Fleet List: The remains of scrapped Titan 71 finally left the depot today. Thanks to Steve Wickens for this. Stagecoach in Oxfordshire and Warwickshire Fleet List: 22057 and 34466 went to Swindon on 16th, and returned on 19th. In addition two Brookesbus Tridents were loaned to Bedford for the day on 19th to help cover exceptional loadings on the X5. Meanwhile on the same day an X5 branded coach was noted on a private hire parked at Rivermead in Reading! Stagecoach in Oxfordshire and Warwickshire Fleet List: 22057 and 34466 are reported as on loan to Swindon for an expected stay of one week. Thanks to Dave Rogers for this. First Berkshire: This company has been named the preferred operator for Surrey County Council's new "Pegasus" school bus project with the first 6 of 22 new buses starting in January 2006. 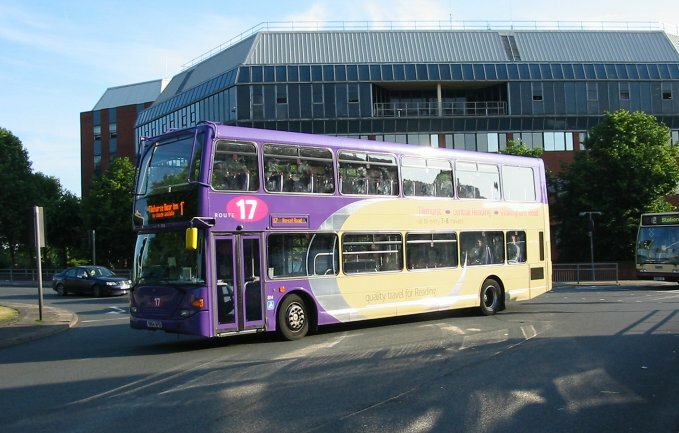 The contract would be for five years, and the preferred vehicle supplier has been named as East Lancs. Thanks to Mac Head for this. Stagecoach in Oxfordshire and Warwickshire Fleet List: 16525 has transferred from Banbury to Oxford. Upto two B10Ms from Oxford may be on loan to Witney, and upto two Varios from Witney to Banbury pending new Optare Solos. Exact details aren't yet known. First Berkshire Fleet List: 42411 has moved from Bracknell to Slough. Thanks to Stephen Le-Bras for this. Weavaway Travel Fleet List: Four new Scania / Irizar PBs are on order for delivery in the autumn. They will wear a new fleet livery of light metallic blue. In addition two further Volvo B9s have also been ordered. Information taken from a feature in Route One magazine dated 2nd June 2005. Stagecoach in Oxfordshire and Warwickshire Fleet List: Leamington 20704 has been withdrawn and put into store at Nuneaton after a few weeks on loan to Rugby. Stagecoach in Oxfordshire and Warwickshire Fleet List: 33351-6 entered service at Rugby yesterday, whilst 40158/9 have been withdrawn and moved to Nuneaton with 40150 expected to follow. Thames Travel Fleet List: Mercedes-Benz 616CDi demonstrator BU53 AYC has been on loan pending the recent arrival of 305. Thanks to Brian Coney for this. Stagecoach in Oxfordshire and Warwickshire Fleet List: 22941 has lost it's MegaRear for Wella Essensuals following repaint. Thanks to Malcolm Crowe for this. Bus Zone Home: General update to page, with news and updates links made completely separate. It is also noted that this site has now had well over 100,000 visitors since it was first started in 1998! Aldermaston Coaches Fleet List: H458/9 FLD have not been sold, and have fleet numbers 2/1. Thanks to Derek Bradfield for this. Previously they were shown as 5/3 on the list. Reading Optare Spectras: 751/2 passed to Holmeswood Coaches where they were reregistered MUI 4841/2, and then to Shamrock Buses, Poole by May 2005. Reading Plaxton Paramounts: 758 passed to Bennetts, then Heyfordian and finally Hafan Coaches by early May 2005. During this time it was also re-registered TJI 6302. Stagecoach in Oxfordshire and Warwickshire Fleet List: 16514 is the second Olympian with X1 branding. Thanks to Terry Wightman for this. 31321-26 have lost their route 6 branding, whilst 33351-6 are to receive it instead when they enter service from 5th June. 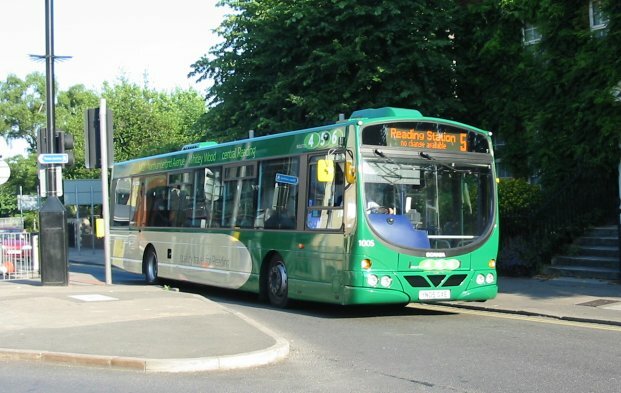 31321-4 are to receive new branding for Rugby route 1 (Hillmorton - Abbots Farm - Rugby - Woodlands - Shakespeare Gardens) from 5th June, whilst the route 86 branding is being altered to omit Hillmorton in preparation for the changes to that route also from 5th.